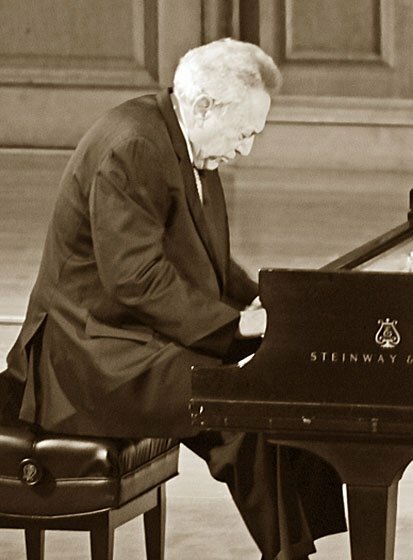 Not a lot went right as eminent NEC pianist Gabriel Chodos essayed three Beethoven pieces Tuesday night at Jordan Hall. Many measures evinced his naturally rich sonorities, true, and as always a certain patrician maturity overlay the proceedings. Opus 101’s slow movement, to be played yearningly, did yearn. Some of the Appassionata sonata held, or came, together—the four reposeful variations, simply burnished, glowed—and at the end the heedless closing pages got executed impressively, with considerable excitement. But elsewhere, and indeed from the opening notes of the Andante favori, smudge ruled, whether it was trills, runs, pedaling, or thick chord voicings, and frustrating blurs were what regularly floated out into the acoustically marvelous space. On a few occasions we heard near halts to regroup or downshift. As they age, even the top pianists come to a point where they ought not essay certain mainstream composers, at least not their difficult major works. Chopin and Beethoven are often said to be a good test. The audience response to all of this Beethoven was inexplicably strong, and the encore, a Schubert Musical Moment (no. 2, from 1823, Schubert 26), made it plain we should hope for more Chodos. A longing monotony of patience and impatience, its slow pained drama and choral probing were imbued with rich color. He took brave tempi at times, heedless of his current technique, and would have carried us before him had we not worried about the next breakdown. He had a strangely mushy legato, sounding sometimes simply like overpedaling, although it was not. He was often unable to weight individual notes either in smooth phrases or in even chords. And yet in the Schubert, he could relax into his old magic. I rarely miss a Chodos recital. I don’t expect staggering technical brilliance. I do expect musical depth and an exceptional ability to let the notes deliver their message in an unadorned, yet profound way. This recital met my expectations. I heard the same positives and negatives that reviewer David Moran heard. But I would not, at this point, attribute the “thick chord voicings” and “mushy legato” entirely to Chodos. I have been underwhelmed by the sound of the NEC concert grand in Jordan Hall ever since it was acquired (6 or 8 years ago?). It seems to me that there is always a lack of clarity in complex passages, and the typical “Steinway growling bass” is absent. I remarked to a friend at the end of the concert that I didn’t think I’d want to attend any more solo piano recitals at Jordan Hall, regardless who was playing, because the instrument just doesn’t sound good in that space. This may be heresy, but I think it’s time for an objective evaluation of the acoustics of Jordan Hall, particularly as regards solo piano recitals. Concert hall acoustics is a difficult, largely subjective area. We need to put aside the stunning architecture of Jordan Hall and try to be more objective about the sound. For piano recitals, I certainly don’t find the hall “acoustically marvelous.” I have sat in many locations throughout Jordan Hall. There is a large variation in sound quality, depending on location. For this recital, I sat at the back of the orchestra section (but not underneath the balcony), slightly right of center, which put me directly in the path of the sound reflected off the piano lid. I don’t think there’s a better seat location for a piano recital. – Try moving the piano closer to the front of the stage – the high ceiling above the stage is a reverberant cavity that may be affecting clarity. – Try placing a sound absorber under the piano to dampen the effect of the stage floor on the radiated sound. – Try acoustic cloud panels above the piano (architecturally obnoxious, but this is just an experiment, OK?). Most interesting. I have never really formed an opinion one way or the other in such detail, since JH is so much nicer than many venues. I certainly will listen more acutely and perhaps skeptically next time thanks to your observations. I have often enjoyed the combination of focused and airy sound heard when leaning on the upper-right balcony up by the stage, since having discovered it ~45y ago for a Brendel recital. For this performance (notably less dry than when the house is packed, and I sat quite a bit closer than you, at about the same angle), there was an unusual amount of tuning at halftime, but tuning, and that piano, didn’t account for what I described, I think. Perhaps acoustician David Griesinger and Lee Eiseman will have reactions. None of the critics who complained about the sound in Jordan Hall after the most recent “restoration” noted that the original 12ft. high velvet valence had been removed from the proscenium arch. I assisted David Griesinger a couple of summers ago with a test of a temporary replacement. It made a real improvement in reducing over-resonance in the stage box. Alas, management was not interested in doing a test before an audience. David can quantify the differences. It also seems that other pianists may try to articulate more. Piano recitals in reverberant spaces are always problematic, and Jordan is too reverberant for much of the music that is played there. The problem is not with the hall but in the stage house. The stage house is deep, relatively low ceilinged, and mostly reflective. Sound bounces around in there a lot before it escapes. Compare this to the stage house in Boston Symphony Hall, where the stage house is high. Reflections from the ceiling to the floor have half the sound pressure than they do in Jordan. In Symphony Hall the side walls are wide, and angled so all reflections from them will go out to the hall. The back wall is, at least for orchestra, pretty well shielded by other musicians, and the upper half is absorptive from the organ. In Jordan for the first 30 years or so the muddy sound from the stage box was reduced in the hall by the kind of stage drapery typical of theaters at the time. These included a large curtain over the top of the proscenium, and curtains on either side of the proscenium opening. These drapes enabled speech from the middle of the stage house to be clearly heard throughout the hall – something that is impossible now. The side curtains were long gone when I started performing and recording there in the seventies, but the proscenium curtain was still in place. The sound in the hall was very good, even when it was lightly attended. But in 1994 the proscenium drape was removed by Kirkegaard, and a hue and cry resulted from both musicians and audience. As Lee mentioned two summers ago we made an experiment by replacing the curtain with moving blankets hung upstage from the original. This was not the right place for it, but the best we could do. We used Tapio Lokki’s electronic orchestra techniques to create a virtual string quartet plus soprano on stage. We also attempted to emulate a small audience with a truck load of curtains spread about the hall. Without the curtain the sound became muddy more distant than row I on the floor. With the curtain the sound was clear all the way to the rear of the floor. We made binaural recordings that clearly show the difference. The report we made about the experiment was duly given to the NEC administration, and seems to have dropped into a black hole. So what can be done in the mean-time? The obvious thing is to bring the performers out of the cave of the stage house and closer to the audience. The problem is, musicians generally like the high early reverberant level inside the stage house. They are very close to their instruments, and the level of reverberation appropriate for the audience is not particularly audible to them. But moving out can make an enormous difference for a piano recital or a string quartet. But they mostly don’t. For an audience member the solution is clear – sit on the floor in a seat closer than row I. What about the particular problems with the piano? Pianos indeed have a lot of sound bouncing off the open top and into the hall. This improves clarity, but only for some of the audience. But at the same time there is a lot of sound coming from the bottom, and this fills the stage house with mud, particularly for notes in the left hand. Pianists should be aware that very light pedaling can greatly improve the clarity of a performance in a reverberant space. Reverberation takes time to build up. If you keep the note short the masking of reverberation is lessened. In a reverberant hall the hall provides the sustain, you don’t need it from the piano. I wish piano instruction included just a bit of common sense about how to let the audience hear the music as it was intended, or as the person at the keyboard is probably hearing it. One of the best sounding piano recordings ECM’s “Meredith Monk: Piano Songs” — was recorded in Jordan Hall using the two Steinway pianos that are there now. I think they recorded it in 2013. The actual sound of each piano is gorgeous. There are a variety of solo and 2-piano pieces. You know the ECM people are picky and fastidious and they made this recording in Boston, at Jordan — and it’s regarded as one the best piano albums recently!